Hi friends, in this article, I am discussing about dynamometer type wattmeter working principle and related information, if you are interested in it then you at the right place. These are basically moving coil instruments. In these instruments, the operating field is produced by the fixed coil instead of a permanent magnet. The instruments in which the operating field is produced by the fixed coils are known as electrodynamic or dynamometer type instruments. The dynamometer type wattmeters are very important because they are commonly employed for measuring power in AC circuits. The basic dynamometer type wattmeter working principle is that when a current carrying moving coil is placed in the magnetic field produced by the current carrying fixed coil, a force is exerted on the coil sides of the moving coil and deflection takes place as shown in figure(a). In other words, when the field produced by the current carrying moving coil (Fr) tries to come in line with the field produced by the current carrying fixed coil (Fm), a deflecting torque is exerted on the moving system and deflection takes place as shown in figure(b). A dynamometer type wattmeter essentially consists of two coils called fixed coil and moving coil. The fixed coil is splitted into two equal parts which are placed parallel to each other. The two fixed coils are air-cored to avoid hysteresis effects when used on AC. 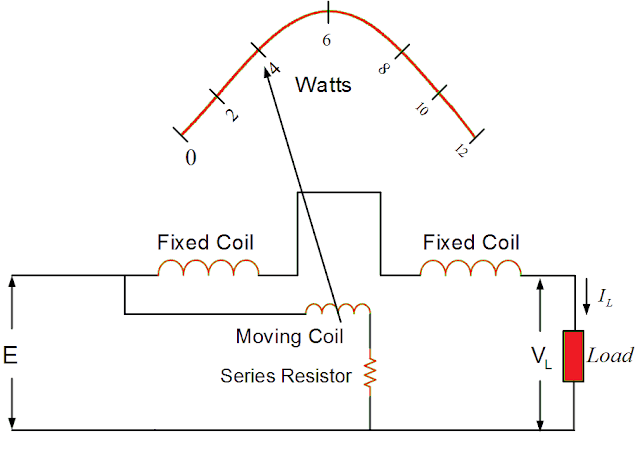 The fixed coil is connected in series with the load and carries the circuit current. It is, therefore, called current coil. The moving coil is pivoted between the two parts of the fixed coil and is mounted on the spindle. A pointer is attached to the spindle which gives deflection. The moving coil is connected in parallel with the load and carries the current proportional to the voltage. It is, therefore, called potential coil. Generally, a high resistance is connected in series with the moving coil to limit the current through it. By limiting the current, the moving coil is made of light weight which in turn increases the sensitivity of the instrument. The controlling torque is provided by springs which also serve the additional purpose of leading current into and out of the moving coil. Air friction damping (not shown in fig.) is employed in such instruments. When power is to be measured in a circuit, the wattmeter is connected in the circuit. The current coil is connected in series with the load, carries the load current and the potential coil, connected in parallel with the load, carries the current proportional to the voltage across the load. The fixed coil produces a field Fm and moving coil produces a field Fr. The field Fr tries to come in line with the main field Fm, which produces a deflecting torque on the moving coil. Thus, the pointer attached to the spindle of the moving coil deflects. The deflection is controlled by the controlling torque produced by the springs. Also read — Power Measurements in Three Phase Circuits. It can be used both on AC and DC circuits. It has a uniform scale. High degree of accuracy can be obtained by careful design. At low power factors, the inductance of the potential coil causes serious errors. The reading of the instrument may be affected by stray fields acting on the moving coil. In order to prevent it, magnetic shielding is provided by enclosing the instrument in an iron case. Error due to potential coil inductance: The inductance of the potential coil is liable to cause an error in the reading of the wattmeter. Because of this error, the wattmeter gives a high reading on lagging power factor and a low reading on leading power factor. The high non-inductive resistance connected in series with the coil swamps, to a great extent, the phasing effect of the potential coil inductance. Error due to power loss in the potential coil or current coil: Another possible error in the indicated power may be due to some voltage drop in the current coil or the current taken by the potential coil. This defect can be overcome by having an additional compensating winding which is connected in series with the potential coil but is so placed that it produces a field in opposite direction to that of the current coils. Error due to eddy currents: The alternating field of fixed or current coil induces eddy currents in the solid metal parts which set up their own magnetic field. This alters the magnitude and phase of the magnetic field, causing deflection. Thus the error is introduced in the instrument reading. To reduce this error, the solid metal parts are removed as far away from the current coil as possible. Error due to the stray magnetic field: The dynamometer type wattmeter has the relatively weak operating field; therefore, stray fields affect the reading of this instrument considerably and cause serious errors. Hence, this type of instruments must be shielded against stray magnetic fields try using iron cases or providing thin iron shields over the working parts. (i) Current circuit 0 – 0.25A to 0 – I00A without employing CTs. (ii) Potential circuit 0 – 5 V to 0 – 750 V without employing PTs. Thanks for reading about dynamometer type wattmeter working principle. 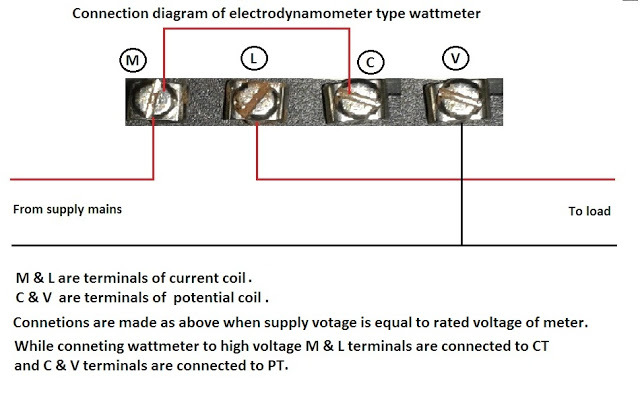 © https://yourelectricalguide.com/ dynamometer type wattmeter working principle pdf.